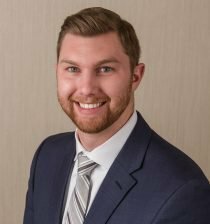 Tyler S. Lemen is an Associate Attorney at Drewry Simmons Vornehm, LLP and a member of the firm’s Health Care Services Group. He concentrates his practice representing long term care facilities and health care providers in negligence and malpractice litigation. Prior to joining DSV, Tyler focused his practice on employment discrimination, litigating ADA, FMLA, Title VII, ADEA, and wage discrimination claims. He also served as a law clerk where he gained experience in class action, mass tort, and complex business litigation.